AHock are a German manufacturer who own the rights to the Honeywell Industrial product range, which have been installed in to many plants across the UK and globally, since the 1970’s. AHock have also developed their own range of products focusing on control valves and associated equipment for typical industrial processes. Their standard deliveries and support service are second to none, and they place enormous emphasis on competent professional consultation and fast reaction times. Controlled Repair are the only UK service and distribution centre for AHock equipment. We have direct access to AHock factory stock spares available as quickly as 24 hours and for certain products within their extensive range. For further information on AHock products, please visit their website. Two way control globe valve. Single seated, straight through valve. 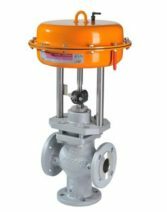 Series 2000 is a complete series of two way control globe valves. The valve is single seated and has a top-guided design. The straight through valves are actuated by pneumatic actuators Series 2000 and Honeywell MP953 or electric actuators Series E2000. The combination with electric Honeywell linear actuators ML642/ML742 ist also possible. Hundreds of thousands of valves from this series have been installed worldwide and are valued for their suitability for a wide range of applications and their outstanding reliability. This series includes universally-applicable three way control globe valves for mixing (2003) and diverting (2013) operations. The control valves are actuated by pneumatic actuators Series 2000 and Honeywell MP953 or electric actuators Series E2000. The combination with electric Honeywell linear actuators ML642/ML742 ist also possible. Same mounting dimensions like Series 603, 613, 1003, 1013, V5066 and Honeywell V5050A / V5050B. The adjustment valves of this series are characterised by their quality and versatility. Series 2000 pneumatic diaphragm actuators are capable of operation within extreme ambient temperature conditions and can withstand severe shock loadings. Universal in application, the standard actuator top works can be used in conjunction with a wide variety of control valves. The EP2500 is a two-wire loop powered, 4-20 mA input digital valve positioner. The EP2500 is completely powered by the 4-20 mA input signal. The minimum input signal required to function is 3,6mA. Easy installation by 1-button calibration.